Rachael Ray believes that the kitchen is more than just a working space and that food should be fun to prepare and a treat to enjoy. Her cookbooks, such as "Rachael Ray 365: No Repeats - A Year of Deliciously Different Dinners" offer great ideas for delicious meals that can be prepared quickly. Busy households require quick meals, but with Ray's suggestions on food and her well-designed cookware and kitchen tools, food preparation doesn't have to be a chore. What Is the Rachael Ray Brand? Rachael Ray loves people, pets, food, and problem-solving. Her goal with her cookware is that it be both affordable and of excellent quality. When interviewed by Entrepreneur, Ray used one of her favorite catchphrases, "you don't have to be rich to have a rich life." Rachel Ray kitchen products include easy to maneuver casserole dishes, built with molded handles that let you reach in and grab to lift them from your cupboard. Her bakeware is all nonstick and has bright orange accents, adding a splash of color and a more secure grip when removing food from the oven. All of her kitchen implements such as spoons and spatulas are safe to use on her nonstick, pans. In addition to versatile, heavy-bottomed cookware available in a wide array of colors, Ray's product line for the home includes furniture with square cushions, easily reversed. She also designs side tables with drawers that push all the way through for easy access, furniture with spaces for cords to run through, and pieces that can work either in the bedroom or the living room. Ray represents her brand well, including a private music fest at South by Southwest in Austin, featuring her favorite musicians, food, and adult beverages. This set includes a Dutch oven, two sauce pans, a large saute pan and two frying pans. There are four lids included which fit all but the smallest frying pan. Finally, this set includes a slotted turner and a stirring spoon, both safe for the nonstick finish on these pans. 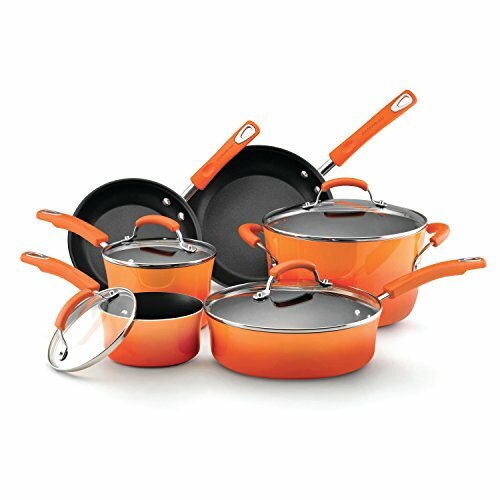 The Rachel Ray product line strives to offer good value for a fair price, and this set certainly qualifies for that. The aluminum pans are of good quality. While they won't work on an induction cooktop, they will conduct heat well and should be easy to clean up. The lids are built of shatter-resistant glass and offer a stainless steel rim for more protection. The handles are all stainless with a silicone sleeve of bright cranberry for beauty and comfort. This silicone sleeve is oven-safe up to 400 degrees Fahrenheit / 204 degrees Celsius. However, some users have found that the silicone sleeve will bleach in the dishwasher. This cookware set includes two saucepans with lids, a lidded stockpot, a three quote saute pan and two frying pans at 8.5 and ten inches. The included lids will fit everything but the 8.5 inch frying pan. 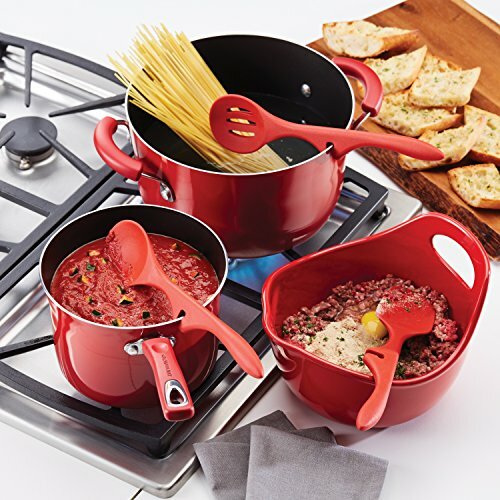 For those who prefer color-coordinated cookware, note that this red set moves beautifully from bright red to nearly black at the base and will look great on a pot rack. Wile this may be a bonus for some cooks, the overall weight of this set (just 16.28 pounds once packaged) suggests that these pans may have a limited heat tolerance over time. Cooks who like to move from stovetop to oven for a finish should also note that the silicone sleeve feature on pan handles and lids is only oven safe to 350 degrees Fahrenheit / 177 degrees Celsius. 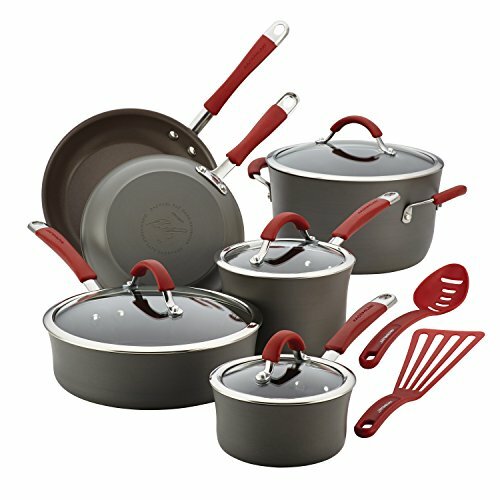 If, however, you're looking for some light use and beautiful cookware, this is a great set for display and gentle use. It is not dishwasher safe. This grill pan would be a great tool for any cook trying to reduce the fat content of their food. 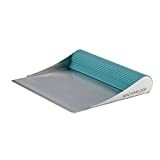 It features hard anodized aluminum construction and has taller sides than a standard grill pan or any griddle, making cleanup much easier as there's less spatter. For an aluminum pan, this grill pan is quite beefy, weighing in at 2 pounds. It features an orange silicone handle for easy gripping that's oven tolerant to 350 degrees Fahrenheit / 177 degrees Celsius. 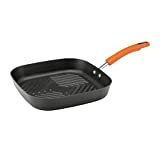 The Rachael Ray grill pan is designed to be dishwasher safe, but nonstick pans in the dishwasher can be damaged by knocking into other items in the dishwasher. This final step is crucial. Hard-anodized aluminum is quite stable under heat, but if you put a hot pan in water, the aluminum can warp slightly, causing the nonstick coating to flex and split. Over time, this split will cause the coating to flake away. If you've ever lost a cast iron piece of cookware to rust, you'll appreciate this hearty pan! 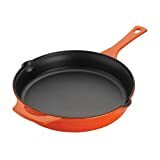 The exterior is enameled a bright orange, so you only have to worry about seasoning and protecting the interior of the pan. This pan weighs in at just over five pounds. To make this easier to handle, the pan is designed with a helper handle on the far side of the long handle. Two pour spouts increase the versatility. Also, this pan can go from cooktop to a 500 degree Fahrenheit / 260 degree Celsius oven for a crisp finish to any dish. See our cast iron skillet reviews for similar options. There is some confusion with the description of this pan as having a white enameled interior. This is inaccurate because the interior is cast iron and will need to be seasoned, or at least you will need to use fat when cooking in this pan. On a side note, the Knapp Made CM Scrubber is a tool to help cleaning the pan before seasoning. Cast iron cookware is easy to use if you remember to protect the seasoning or oiled coating. Do this by always cooking with fat (I protect my cast iron by preparing bacon in it when it looks a bit dry) and by avoiding acids such as tomato sauce in these pans. Tired of leaving sauce drips all over your cooktop? Or worse, grabbing the wrong spoon off the counter and stirring your pasta with the sauce spoon? These clever tools will help protect you from these mistakes! 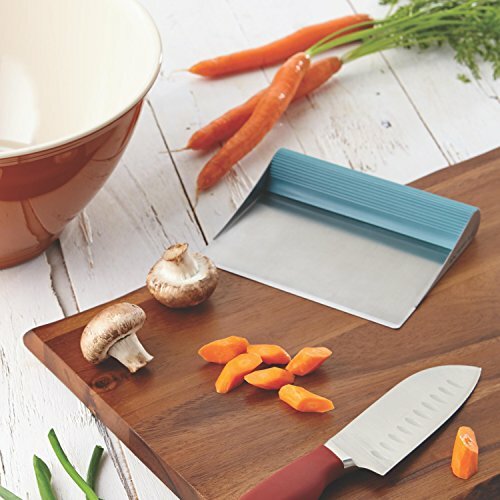 Rachael Ray's design concept of solving problems for her fans is on full display in these unique and helpful kitchen tools. The angle of the handle makes it easy to attach it to the pot that you need it for. When it's time to stir, you're ready to work! These helpful tools are dishwasher safe and can tolerate up to 500 degrees Fahrenheit / 260 degrees Celsius. They are 100% silicone and quite durable. If you tend to have the oven hot while you work on the cooktop, these tools can save you a lot of scrubbing. Rather than leaving drips on the cooktop that can bake down into stubborn stains, you can keep your stove clean and always have the spoon you need! 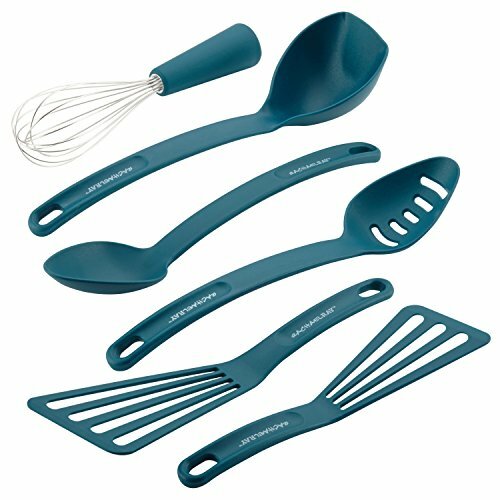 These nylon tools will work well with any nonstick set of cookware (except for the stainless steel whisk) and are a beautiful shade of blue. Rachael Ray's product line does a great job of reminding us that tools can be beautiful as well as functional. This set includes two nylon flipping tools, a slotted stirring spoon, a solid stirring spoon for serving and a ladle. Also, this set comes with a stainless steel whisk with a flared bottom; you can stand the whisk up and reduce drips on your counter and cooktop. 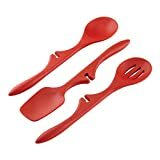 From hot pot to dishwasher, these plastic tools will hold their shape and make the task of cooking much more enjoyable! If you've ever spent time chopping up vegetables only to see them tumble to the floor, you'll wonder where this scrape has been all your life! This tool makes it easy to go from cutting board to stock pot or saute pan with one easy movement. Your scrape features a stainless steel, non-reactive blade with a rubberized handle for easy gripping. You can move garlic, onions and anything else pungent and not worry about any odor lingering on the stainless steel. This tool is dishwasher safe, but can easily be cleaned up with a bit of soapy water. When you're ready to store this tool, you can attach it to a magnetized strip until you're ready to use it again! 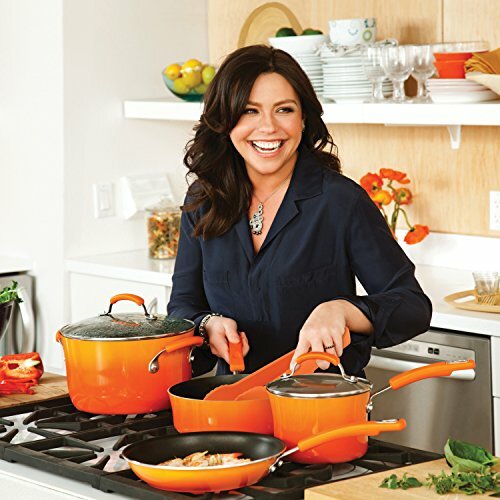 The Rachael Ray brand strives to solve problems and make home life easier and more enjoyable. Even if you're not a homebody, you can enjoy helpful kitchen tools and useful cookware. Vegetarians can find many uses for the aluminum grill pan, while dedicated carnivores can put the cast iron skillet to good use. The scrape can be put to great use on anything from stock to salads. Invest in nonstick pots and pans that suits your needs and treat them with care! Remember that cookware is an investment, not an accessory.